With flowers in hand instead of a football, number 12 is wheeled down the hall and around the corner into Jason’s room. This complete stranger that will soon dominate our conversation for days to come is shocked and ecstatic to see Jim Kelly in his room. The nurses and everyone else in the room can’t help but feed off of the contagious joy radiating from this man. You would never know he had just weeks to live. He celebrates every heartbeat and acts more alive than most people who enjoy perfect health. A beautiful, overwhelming silence wrapped itself around us followed by one of the most precious and moving prayers I have ever experienced. I wish I could remember everything Jason said to God. I wish I could adequately explain what it was like to have a young man dying of cancer, given weeks to live — a mere handful of heartbeats… pray for my husband, the man who means the most to me in all the world, who’s fighting for his life because of the same dreadful disease. I wish you were there because I know you’d be in awe of God as I am right now trying my best to share this with you. As soon as Jason stopped praying, Jim looked up at him moved by compassion, laid his hand on Jason’s shoulder and began to pray. After Jim stopped praying, we all just kind of stood there, awestruck. And in a way they still do. We invited our pastor over to pray with Jim today. After some small talk and an update on everything that has transpired over the last few weeks we were ready to pray. The doorbell interrupted us and I jumped up to get it. The house was starting to fill up as the Kelly brothers made their way over one by one, as well as friends and teammates. Peter John, a long time, close friend of Jim’s, was at the door. We exchanged greetings, made the necessary introductions, and then prepared to go back to prayer. Before Pastor Jerry began, however, he said. “Before we pray, I’d like to tell you something that I think will encourage you,” upon which he recounted how before he came to our house he had had a meeting with another pastor in the area. During that meeting the pastor shared with Jerry how he had visited a young man, a member of his church in the hospital the day before. Jerry went on to explain how this young man was in his late thirties and dying of cancer. As Pastor Jerry continued to share the story his pastor friend had recounted, I knew it was Jason. And it was. If you know me at all, this is the point when I start freaking out, ready to jump out of my skin. I could hardly contain the joy! And in all these things God works for the good of those who love Him… You can literally trace the hand of God weaving these destinies together to craft a beautiful tapestry of His glory throughout this incredible story. Those few moments in time where His grace, love, mercy, compassion, and tenderness were tangible — felt by those who were there and now can be shared by all who hear this remarkable story. Through the joy of a dying man, yet another warrior fighting the battle is given hope, and is blessed beyond measure. From a friend moved to send flowers during his buddy’s time of great need, to the prayer of two saints both seeking the heart of their Savior we see the loving, strong, sovereign hand of their God at work. In the midst of suffering we find a contagious joy and shared hope that causes both men, to not just endure this trial they have been entrusted with…But to triumph through it, to the glory of the God who loves them and gave Himself for them. Oh Jill, how awesome this is. I hope you and Jim will one day share this in church. God is an awesome God worthy to be praise! You have a lot to be thankful for. Lo♥e you my friend! I am praying for you all. You have ministered to myself and many others in your books and blog. This is another living Bible story. We trust Gods master plan for you and He will provide constant peace. What a truly amazing story. I’m so speechless. I think it really shows how small the world is and that so many of us are on the same journey to connect with the same loving and powerful God. I can’t imagine what it was like for you to meet Jason. I’m humbled by his courage. I know I couldn’t be that strong if I was walking in his shoes. It shows me I have to work even harder at putting all my trust and faith in God. I’m praying for Jim and your family every second. It’s definitely a struggle to try to balance being positive and having faith with facing the fears and realism. But Jim certainly has a bigger struggle and all I can offer him is my strength and prayers so I’m giving him all I got every second of the day. 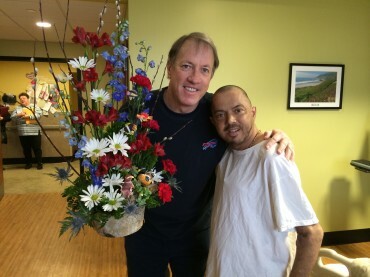 What a beautiful story, thank you so much for sharing, I have always admired Jim Kelly both on and off the field and to know that in the middle of his own struggle and battle he still takes the time to share kindness and love with others. Jason is coming to the end of this earthly journey and instead of waiting to die, he is living each day and sharing his love and faith with others. Jim and Jason both are two incredible men. My prayers are with both of them, for the Kelly family and for Jason’s family. Prayers and Blessings!!! What a glorious Story Jill. It is amazing how GOD works in mysterious ways and we all can see his glory through others. I love how God makes himself visible through your lives. I am praying for you both and have requested my church family to also pray for Jim to recover quickly. I will add Jason to these prayers also. He has so much courage that only God can provide. Hugs to all of you! Jill – an amazing and touching story….When my son was dying of cancer at Westchester Medical Center, I was able to meet one of his friends who was also dying of cancer. She passed not long after my son. My son Stephen, though riddled with cancer was an encouragement to the young children on his “floor”. Our Lord brought you and Jason together for a reason – He strengthens and comforts us when we need it most. We’re praying for Jim’s healing and strength for your family. I have just read about Jim and Jason and I write this through the tears that are streaming down my face. Jim has been my idol and he will always be my idol. I pray every day that God will make him well and strong again. I pray for his family as they also pray for Jim. I will also be praying for Jason. I’m sure that God has brought Jim and Jason together for a good reason. To Jill, Erin and Camryn, keep strong. I will continue my prayers for you and your family. Thank you Jill for sharing this amazing story. I will keep you,Jim and your girls in my prayers. I do believe our Lord has you all close to His heart. Thank you for this story it is amazing and brought tears to my eyes. I have been having a battle of my own since 2000 presently do not have cancer, but have to see a hematologist to be followed. The doctor tells me I am a fighter and he keeps throwing tests all the time to make sure it does not happen. I just keep going as though nothing is wrong as with God on my side all things are possible. Jim I thank you for sharing what you are going through and I pray that your doctor will do the best he can for you. Praying for you all. Now I am at a lose for words. Thank you for sharing this beautiful story. Jim, you, and your family are in my prayers every day. By your suggestion 3 1/2 years ago, my wife, son and I joined The Chapel. For that, I am forever grateful. Best decision I ever made. You continue to inspire me. This story was just another example of that. My prayers are with Jim and your family!May God bless you all! I can not stop crying.. Such a beautiful story! When my dad, Jim was fighting cancer we often prayed, like you! When my dad died at home surrounded by our family. We were struck by how many lives my dad touched! He was an extraordinary man! I know your Jim is as well! Praying for ALL of you! May Jim beat cancer this time too!! TODAY I hope you will know the power and presence and warm embrace of God. TODAY I hope that you will find joy in His unfailing love and promise. TODAY I hope that you will be at perfect peace. You are constantly in my prayers. Love you all!! I am a cancer survivor and I want to share a little about my journey. As I laid in the prep room waiting to have surgery, my heart started to have such a peace. I felt the Holy Spirit telling me to sing. I did just that. short little parts of hymns of old as well as newer songs of praise. He brought me thru this dreaded disease but had He chose to take me home I couldn’t lose.As I read the incredible story about Jason and Jim, my eyes started to tear up. God is such an awesome God. In the good times and in the bad times, He is always there. When Jesus reaches out to us what a humbling experience, but it’s only a taste of what is to come. We will one day stand face to face with the one true God and will immediately be on our knees for what He has done. God bless and I too am praying for you. This post is so poignant and beautifully written. I am in awe of your family’s faith in Yaweh. This is so inspiring. God bless you all. I pray that both Jim and Jason have a miracle happen in their lives this very moment. Yaweh, heal these men both physically and spiritually now. You are God, and You can do anything. Praise be to God and His only begotten Son Yeshua.